Hello again. Since the last newsletter Sandra, the kids, and I have been on an Outback trip to Broken Hill and back. We had a great time and there are some pictures below. 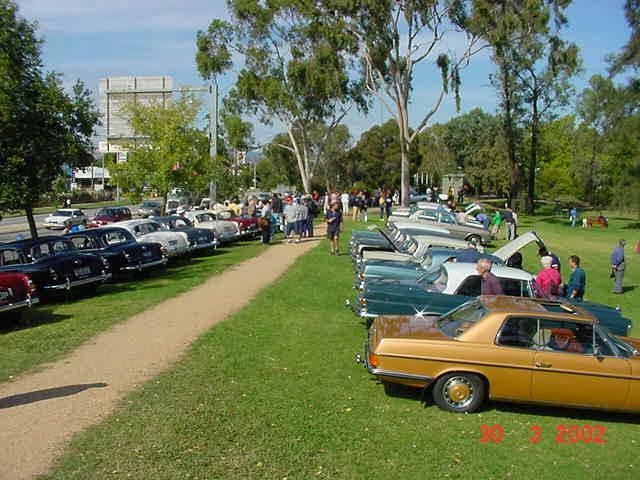 This newsletter we have the second instalment of the MBCV Albury trip, the history of the E class and the worlds best 300SE site. Changing your e-mail address or don't want to get notified about our newsletter any more? MBCV Albury trip (part 2). Last newsletter we covered Thursdays and Fridays activities. 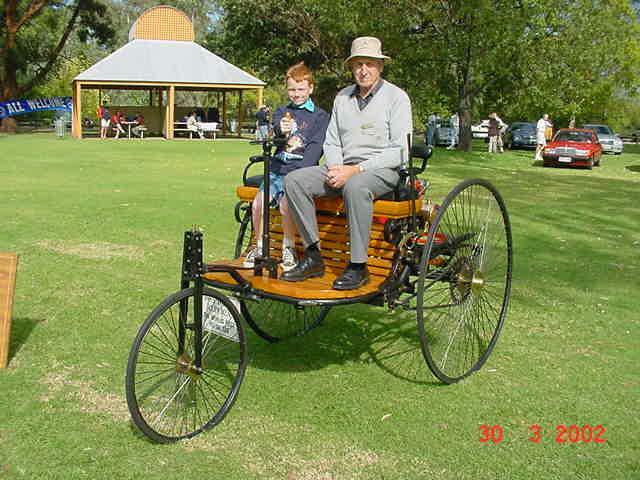 Saturday was the display day held at Hovell Tree park in Albury. The Park is named after the tree that Hovell marked on his expedition North with Hume in 1824. The tree is still there for all to see. 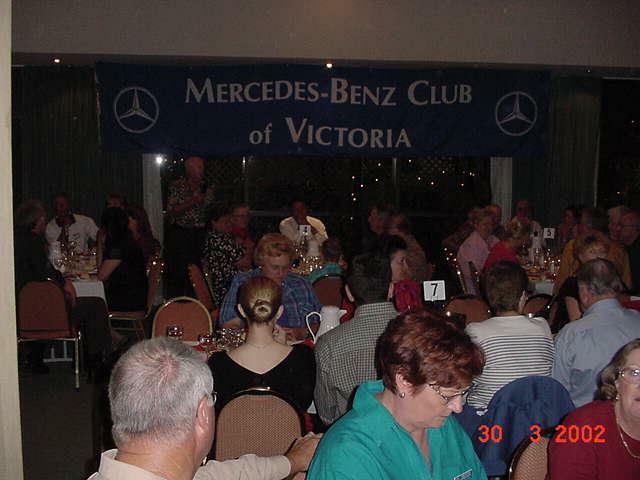 The Victorian club is a large club and is run on a Register system. Apart from being a member of the club, you are also a member of the register that your car is from. The cars were arranged in the park in their registers. As you can imagine, there is quite some rivalry between these registers and lively debate raged as to which regiser had the better display! Hovell Tree park is on the Hume Highway immediatly after crossing the Victorian/NSW border. The display of cars was seen by many thousands of motorists heading in either direction with the Roundie and SL Registers having pride of place at the head of the display. One of the highlights for the day was to see Jim French's 1885 Benz replica not only driven from the Motel where we were staying, but for a few extra laps of the park. I have a .mpg file of this and will try to get it compressed so that I can include it in a future newsletter. My son James even got to ride in the replica on the return trip to the Motel. For those of us that were interested, there was a 1 hour Paddle steamer cruise to enjoy, and a Sausage Sizzle lunch was put on by the Club for everyone. Saturday night was another eventful evening with another great meal. The orgainisers changed the seating arrangements each night so we all got to meet some great people over the weekend. Sunday saw us on the road again and heading to Brown Brothers Winery for Lunch at their annual Easter Food and Wine festival. We travelled via Bright which is famous for its Autumn colours and whilst the trees hadn't quite turned, it was easy to see why it is such a picturesque town in Autumn. Just up the road from Brown Bothers were the Milawa Mustard Factory and Milawa Cheeses so everybodies tastes were catered for. The return trip took us though Tarrawingee and Wangaratta. That night we had dinner and dancing at the Albury Commercial Club. 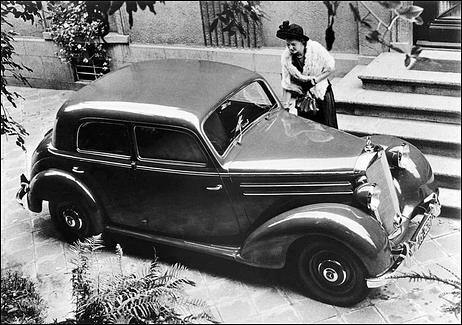 Awards were presented for the the best and worse navigating, and a report was given on the Presidents meeting that was held with Mercees-benz officials on Saturday afternoon (whilst we were all out having fun). James and I drove back on Monday morning after a great weekend, full of great cars and great people. For any of you out there that have thought about joining a Mercedes club and attending these events, do it now before you miss out. Still working on this page, but you can have a look at what I have done so far. What you are looking at is the result of five years hard work by the owner and our company. This is a fully rebuilt/restored car and has already won a considerable amount of awards. Just a few shots from the trip this time, will give you a bit of a report next newsletter, including instructions on how to make a Sprinter fly (literally). These two shots were taken on the banks of the Darling river near Menindee and at the Mad Max look out near Silverton. Many newsletters ago we featured the Heckflosse site dedicated to the W111 and W112 Fintails sedan from the Netherlands. This time we have a simaliar site soley dedicated to the W112 sedans, coupes and Cabriolets. These were the best your money could buy back in the 60's and are very highy sought after by collectors now. Check out the registry. The webmaster is trying to track down the history of as many of these cars as possible. To date he has 92 and growing. Have a look at the 65 coupes for a surprise entry. Also have a look at the production changes page for the absolute in 300SE info. 10 Million E Class sedans. The world’s most successful upper mid-range car, with more than 10 million vehicles sold since 1947 acording to a recent press release from Daimler Chrysler. 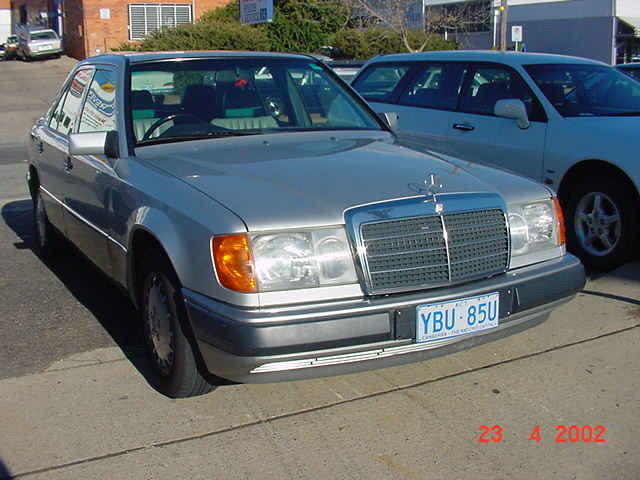 This includes over 10,000 current model E-Class sold in Australia since 1996. 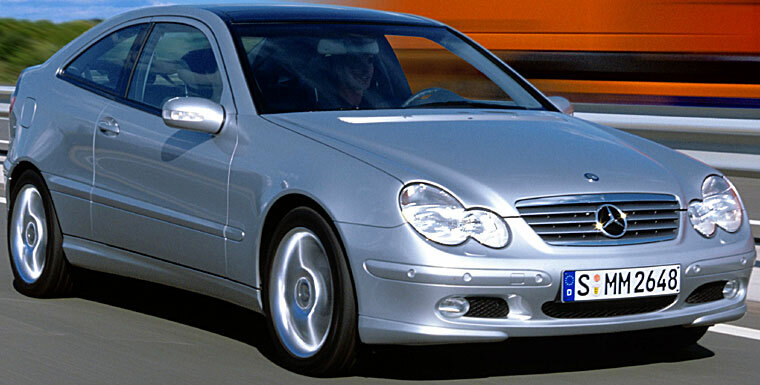 There are some 200,000 E class cars sold annually, the current Mercedes-Benz E-Class series is the most successful sedan in the upper mid-range segment. Enjoying an average 24-percent market share across the globe, the current E-Class (W 210) has also expanded its lead in the segment over the past six years. The model was able to maintain its strong competitive position in 2001, with more than 187,800 vehicles sold between January and November worldwide, more than 1,300 of those in Australia. The first vehicle in this series, the 170 model, was produced back in 1947 and marked the beginning of post-war production. 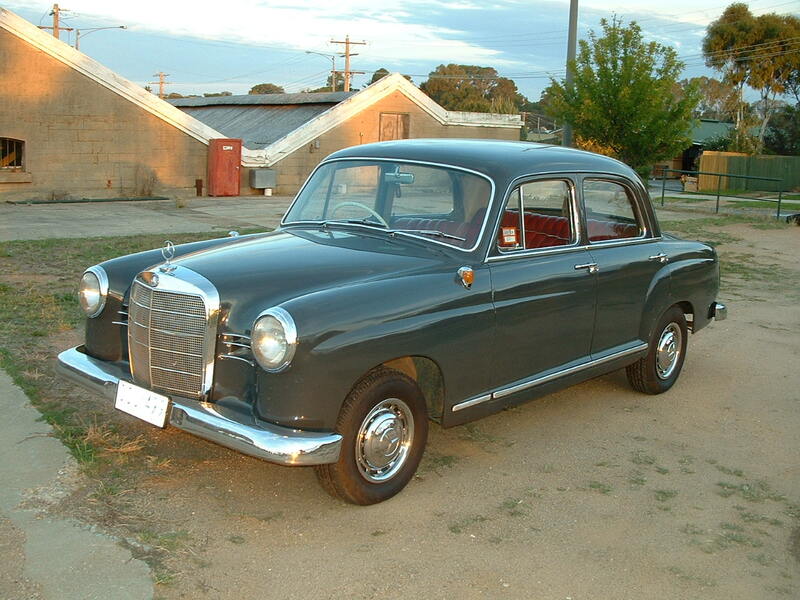 It was followed by the 180 and 190 models, better known as the "Ponton Mercedes," starting in 1953. Including the diesel variants, more than 468,000 units of these models were sold in the nine years of their production. 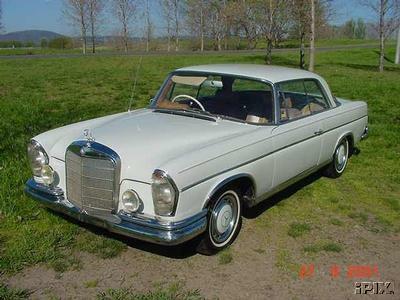 Production of the "tail fin Mercedes," with the internal series designation W 110, began in August 1961. More than 628,000 of these vehicles were produced up to February 1968. This successful model was superseded by the W 114/115 series, also known as the "Strich-Acht" ("dash eight") Mercedes in reference to the year in which production began. Daimler-Benz turned out over 1,919,000 of these vehicles in eight years of production, more than three times as many as the predecessor model. The "Strich-Acht" also brought with it new body variants in the upper mid-range category: The year 1968 saw the model range expanded to include a sedan with a long wheelbase as well as a coupe version. 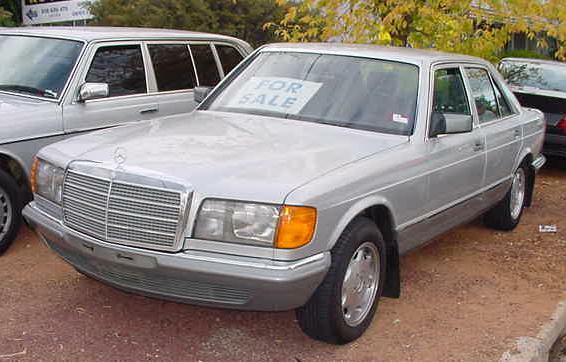 The W 123 series followed in 1976, yielding yet another variant the T-model station wagon. 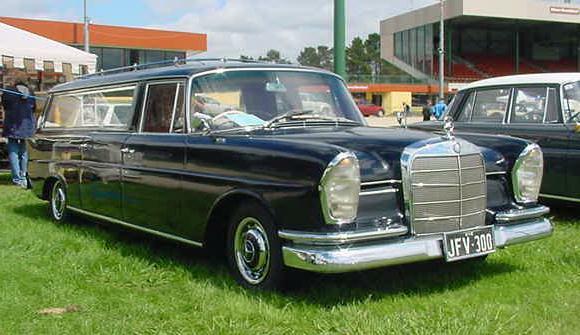 The T-model was not only the first station wagon offered by Mercedes-Benz, it was also one of the first models in this segment. More than 2,697,000 vehicles of the W 123 series had been turned out by the time production ceased in 1985. It was followed by the 124 series, which contributed yet a fifth body variant to the upper mid-range category a convertible, which at its debut in September 1991 ended a 20-year stretch without a four-seater open-top vehicle. The 124 series was notable in other respects as well. 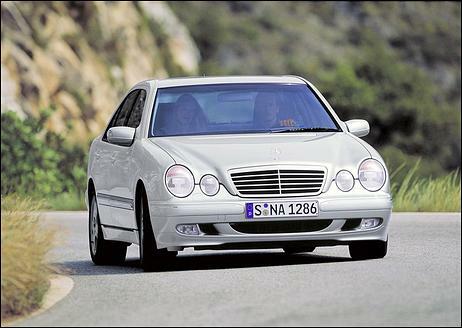 Following a model update in 1993, it became the first series to be known as the "E-Class." 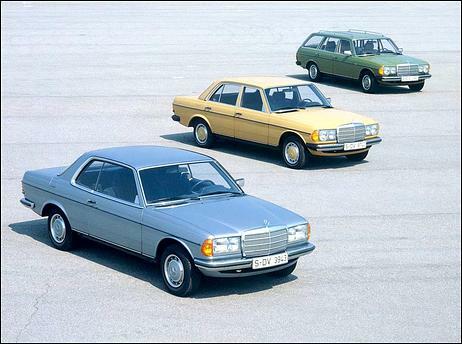 Mercedes-Benz produced over 2,649,000 vehicles from this series between 1985 and 1995. The current E-Class model has received more than 70 awards in all categories over the past six years. These include "Import Car of the Year" (U.S. magazine "Motor Trend"), various other "Car of the Year" awards, the "Red Dot" design award (Design Zentrum Nordrhein Westfalen), "Best Upper-Range Fleet Car" ("Autoflotte" magazine), "Germany's No.1 Car" ("AutoBild"), as well as "Most Fuel Efficient" (Kiplinger’s Personal Finance, U.S.), and "Most Environmentally-Compatible Car in the Upper Mid-Range Segment" (Öko-Trend Auto-Umwelt-Ranking). The E-Class also recently attracted recent attention from experts and admirers all around the world, winning the title of "Best Car" in the upper mid-range segment in the annual readers’ choice vote held by the well-known automotive trade journal "auto motor und sport." Following extensive crash tests, the North American Insurance Institute for Highway Safety (IIHS) also attested to the exemplary passenger safety provided by the Mercedes vehicle. The independent U.S. institute awarded the vehicle its top ranking, "best pick," which has previously been presented to only a very small number of automobiles. Nor has the E-Class had any lack of success in Australia. The Mercedes saloon received the Courier-Mail Queensland Car of the Year Award for the ‘outstanding luxury car’ for the fifth time in a row this year by a wide margin. We have just posted a new page to help or customers who get their parts delivered to them. Have a look here to check it out. We send out more and more parcels every day now and are looking to streamline the process as much as possible. Part of this process to to make sure the customer is aware of the various choices they have. One day I would love to have a nice little java script program on the site that lets you calculate your own freight, but that is just a pipe dream at the moment. The white 300D from the last newsletter lasted only a few hours after the newsletter was published! But if you were interested, don't worry, as I have another one coming. Don't have a photo at this stage but I know it is Willow Green (lt green metalic) with cream MB tex. It is a 83 model which means it is the updated version with the timber trim, rear headrests, etc. 306000kms with full service history. Customers cars that we know are for sale include a 91 230E and a 61 190Db, details appear below. We also have a 72 280E on the way and possibly a 86 300SE with only 176000kms. Don't forget that to see a full size picture of any of the cars we have for sale just click on the picture.